If I had a dollar for every time I heard that, I would have been so rich I might never have had to invent a way to actually do it. Musicians of every discipline repeated this mantra with near Glass-ian consistency. It was easy to understand why. In the late 1980’s, computer-assisted copying and composing was still in its infancy. And, while there existed a few notational programs capable of transcribing notes, they were uniformly inelegant and clumsy, incapable of managing a complex assignment—like the copying of a Broadway show. None of them had the power, finesse or versatility that would be required to take an entire Broadway production, notate it accurately and quickly and, perhaps more importantly, make the innumerable revisions, modifications, adjustments, transpositions and changes that would be required between the first rehearsal and opening night. In those ancient times, music-preparation on Broadway—or, for that matter, anywhere—was still being executed by hand. And every time it was suggested that it might be accomplished with a computer, you could have heard the dismissive laughter all the way back in Minnesota at CODA, Finale’s parent company headquarters. Indeed, it would be years before the technology was not just accepted, but embraced. But before that could happen, generations of tradition, practice, and convention had to be confronted. In 1988, I was a hand-copyist, librarian, proofreader, and printer toiling away in the long tradition of “music preparation personnel.” As a copyist, I spent my professional life in the pursuit of producing readable, page-turnable, accurate parts for the theatre, recordings, , movies, TV, etc. This was when everyone was still reading written music that had been prepared by hand, in pen and ink (and sometimes pencil), written on manuscript paper, with a layered-on collection of ransom-note like correction strips all cut, pasted and taped. It was efficient, but cumbersome. Mostly, it was the way it had always been done. Finale forever changed all that. I learned about Finale—“it’s amazing; you have to see this thing!”—through an arranger whose many recordings, commercials and club acts I had, for many years, been preparing for him by hand. With an address he scribbled on a crumpled piece of manuscript paper (such irony), I soon found myself in a darkened room deep in the theatre district. There, I watched in awe as the notes that I played into a digital piano keyboard magically appeared on an oversize computer monitor. And then, with a few strokes, the music I had just entered was played back! Not only were all the notes there, but being scrolled as they sounded. And fully orchestrated! Yes, the dynamics had to be added, but even these performed as expected: the mp’s were softer than the mf’s; the staccatos were as short as the tenutos were long; fermatas did their job. It was indeed “amazing” and as I walked out into the blazing lights of the great white way, past the Broadway theatres that would become my many second homes for the next couple of decades, I could feel a paradigm shifting. But not right away. In those pre-computer days, while churning out notes, or printing parts on a machine that reeked of ammonia, hastily making last-minute changes in a theatre bathroom, crawling over the feet of players in a Broadway pit—sometimes while the show was going on above—or simply racing against some deadline, I would often muse to colleagues about how much easier transcribing, composing, arranging, printing, etc. would be if it could only be done by machine. I mean, books weren’t being written by hand; why should music? At a time when Finale was still distributed on floppy discs, when it would take ages to launch the program as well as to print a single page, it was hard to argue convincingly that this was the future. Moreover, there was the very real concern and fear that this new technology was going to cost musicians—already a highly unemployed demographic—their jobs. The fact is, there were indeed a few “traditionalists” who were never going to toss away their pens, who would continue to copy music by hand until they retired—or the industry discourteously discarded them. This gave me pause. For as much as I embraced the promise of computer-assisted music preparation, at the same time I mourned the loss of all that beautifully crafted script. Those guys weren’t just musicians; they were artists. And no page of music created on the computer using the fanciest and most “pen-like” fonts would ever match the elegance and grace of those steeped in a tradition that was soon to be decamped. So, in 1989, when my office, Miller Music Service, was engaged to copy the score for Grand Hotel, the first Broadway show using computer-assisted notation (and, specifically, Finale), it was to these experienced artisans that I turned. Rather than reinventing an entire system, it seemed the more prudent and expeditious approach to emulate the rules and formats employed by hand-copyists and honed over centuries, and apply them to the new technology. Some of those musicians made the switch and never looked back. Some remained entrenched. The learning curve was steep and many quit in frustration when early versions of the program proved too idiosyncratic or non-intuitive. But slowly and inexorably, a reluctant industry, from arrangers on down (and up), began to witness that not only could the work be accomplished with accuracy and clarity, but this new system would provide musicians more work, not less, while still allowing for savings in time, money and effort that would be immeasurable. It took nearly a decade for other offices to make the shift, and the transition did not happen smoothly. Many clung to the belief that this new technology would not survive, and for much of that time, Miller Music Service stood as the lone computer copying office, with me referred to as “that computer guy” (it was not a compliment). But eventually the producers’ fears, and the trepidations of the union, were mollified. Resistance diminished and, in time, computers with their great efficiency and speed were welcomed and championed, not just by the old guard, but by a young army of computer-savvy musicians. Today, of course, it is impossible to find a theatre in NYC, a recording studio, a nightclub act, a movie, etc. where the written music has not been transcribed by way of computer. Miller Music Service was involved with over a hundred productions on- and off-Broadway, a list that, in addition to that first time with Grand Hotel, includes such shows as Beauty And The Beast, The Secret Garden, Jelly’s Last Jam, The Goodbye Girl, How To Succeed In Business Without Really Trying, The King And I, Little Shop Of Horrors, Bring In Da Noise Bring In Da Funk, Flower Drum Song, The Boys From Syracuse, Once Upon A Mattress, Titanic, The Scarlet Pimpernel, The Music Man, Footloose, Jesus Christ Superstar, The Little Mermaid, Young Frankenstein, Oklahoma, Aida, 42nd Street, The Producers, The Sound Of Music, and Wicked —notably all done exclusively using Finale and all of it created using a technology that, as little as 20 years ago, was considered laughably inadequate. And while, yes, sometimes the quickest way to turn an A into an Ab is with a pencil, when it comes to the preparation of an entire orchestra, from one large enough to fill the halls of Lincoln Center or small enough to fit in a closet, it makes about as much sense to create orchestral parts by hand as it would be to write a novel using a quill. The pen may be mightier than the sword, but neither of them has a chance against the computer. It changed my life, the lives of many musicians, and, along the way, changed forever the way the curtain would rise on a Broadway show. 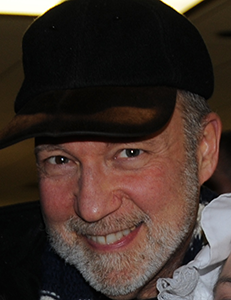 Peter R. Miller is a musical director, composer, audition coach, and music-copyist in New York City. He was the first, in 1989, to prepare the music for a Broadway show—“Grand Hotel”— employing computer-assisted notational software; which just happened to be Finale.